Why do they call it a .38 when it's actually a .357? The short answer is, "Because whoever comes up with the cartridge gets to name it whatever he/she wants to name it, even if the name is misleading." Generally speaking, the "caliber" is the diameter of the bullet in in 1/100ths of an inch - a .40 caliber bullet has a diameter of 40/100ths of an inch. However, for marketing reasons, or to distinguish a new cartridge from a similar existing one, the creator of the round may decide to call it something different. For example, I could create a wildcat round by necking down a .500 S&W Magnum case to .400" and name it the ".420 Eddie Coyle Magnum", even though the bullet diameter is actually .400". A recent real example of this is the Smith & Wesson .460 Magnum, which actually uses a .45 caliber (.452" diameter) bullet. A no-so-recent example is the .38 Special, which uses a .357" diameter bullet. There is a semi-logical reason why the .38 (actual diameter of .357") and the .44 (actual diameter of .429") use these particular caliber designations. To understand it, you have to go back to the days of cap and ball revolvers. Unlike modern cartridge revolvers, the chambers in cap and ball revolvers have no "throat". The part where the powder sits and the part where the bullet sits are the same diameter. In fact, the bullet, chamber, and groove diameter of the barrel (the bore) were all the same. Therefore, a .38 caliber cap and ball revolver had a .38" diameter bullet. After the Civil War, metallic cartridges took over. As you probably know, a metallic cartridge was a case of brass or copper, with a primer replacing the old percussion cap. The case was charged with powder, and a bullet was seated in the mouth and crimped. The early cartridge revolvers were simply modified cap and ball designs with the chambers drilled through so you could load from the breech end, a hinged loading gate on the recoil shield, and a hammer reshaped so that the nose would set off the primer. There was no longer a need for a rammer, so this was removed, and an ejector (to eject the spent cases) was put in its place. The bullet must go inside the case, and the case must go inside the chamber. So the dimensional relationship between bullet, chamber and barrel is now out of whack. If the bullet was to fit inside the case, it would have to have a smaller diameter than the bore, and that wouldn't work. 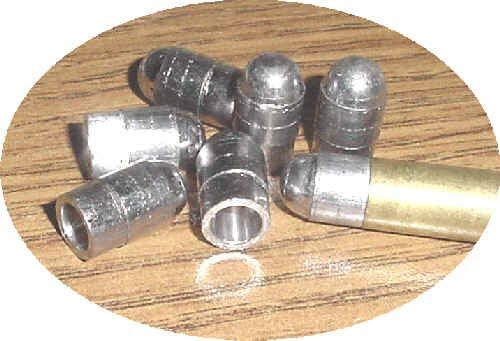 This problem was temporarily solved by using what were called "heeled" bullets (see below). A heeled .38 caliber bullet features a smaller .357" diameter base that is inserted in the cartridge, with a wider .38" bearing surface to fit the bore. This way, the dimensional relationship could remain the same as it did for a cap and ball revolver. Heeled bullets are still used today in .22 caliber rimfire rounds. Heeled bullets had their advantages. Revolver cylinders for heeled bullets were easier to manufacture because they could be drilled straight through, and didn't need a smaller diameter "step" to form the throat. also, when heeled bullets are used, you can fire cartridges of varying lengths with no loss of accuracy caused by freebore space (think about revolvers that can fire .22 short, long and long rifle). This left an unanswered question: How do you lube the bullet? At first, lube was simply was smeared on the exposed portion of the heeled bullet. This was called an outside lubricated bullet. Unfortunately, the lubes of the day were easily rubbed off, and were also sticky enough to pick up dirt, grit, and other contaminates that would harm the bore. An inside lubricated bullet (like we use today) would solve these problems, but simply putting a lube ring on the base of the bullet inside the case would not work because the base had a smaller diameter than the bore, and therefore the lube would not touch the barrel. The solution was to use a non-heeled, inside lubed bullet that could be seated deeper in the case. To accommodate such a bullet, the revolver manufacturers had two choices: they could keep the bullet and bore the same diameter, then make the case larger, the chamber larger, the cylinder larger, and the frame larger... or they could simply make the bore and bullet smaller and add a bore-diameter throat in each chamber. The manufacturers chose the latter because it was more work to redesign and manufacture new larger frames than it was to redesign and manufacture smaller barrels and throated cylinders. The "new" .38s were made with the bore shrunk by twice the thickness of the case wall; which meant about .357" (.360 for the .38 S&W). Because of familiarity, the manufacturers kept the cartridge designation- .38 caliber - the same. The early loads for the "new" revolvers were made with soft lead bullets with hollow bases that when fired, would expand to fill the larger bore on older guns; so they would shoot fairly well in the older barrels as well. Early .38 cartridges included the .38 Colt, .38 Long Colt, and .38 S&W. In 1899, S&W "stretched" the .38 caliber cartridge to produce the .38 Special which became the standard police cartridge for the next 75 years. The .38 Special was originally designed as a black powder cartridge. Shortly after its introduction, it was converted to use the more powerful smokeless powder, which left a lot of extra case capacity - more on that in a minute. In the 1930s, we had the era of the "motor bandit." Bonnie and Clyde would drive their Ford V8 into town, rob the bank, and drive off (usually uninjured) in a hail of gunfire. They were uninjured because the .38 Special rounds used by police were not powerful enough to reliably penetrate the heavy gauge automobile bodies of the day. Law enforcement needed a better cartridge. Around the same time, experimenters like Elmer Keith and Phillip Sharpe were getting good results using the extra case capacity of the .38 Special to try larger-than-normal powder charges. Urged by Keith and Sharpe, Smith and Wesson took their large framed .44 Special Hand Ejector revolver and began chambering it for the .38 Special -- this was a big gun, and in .38 Special left very thick chamber walls. Winchester loaded some very high pressure ammo for this revolver, and both gun and ammo were called ".38/44," indicating that the ammo should be used in a .38 Special built on a .44 frame. The ammo boxes had warnings, "For Smith and Wesson .38/44 revolvers ONLY!" These rounds were essentially .38 Special cases loaded to .357 Magnum specs. In spite of the warnings, some people used these extra powerful rounds in guns that were too weak; sometimes with disastrous results. So for safety reasons, the case was stretched by 1/8" to prevent it from being chambered in "normal" .38 revolvers. This new round was christened the ".357 Magnum" by Douglas Wesson. Ironically, this is the first time the true bullet diameter was actually used in the name. Smith & Wesson produced the first revolvers chambered for this new cartridge (the Registered Magnums) and the rest, as they say, is history. The S&W company presented the first Registered Magnum revolver to FBI chief J. Edgar Hoover, who promptly went out to find a holster that would match his favorite pink satin cocktail dress. The development of the various .44's - the .44 Russian (in 1870), .44 Special (in 1907), and .44 Magnum (in 1956) - followed a similar progression. NOTE: The case stretching didn't end in 1935. In 1983, Remington further lengthened the .357 Magnum by .300" and called it the .357 Maximum. Early handloaders loaded very light bullets with huge powder charges to extreme velocities. These rounds caused excessive flame cutting of the top strap and severe forcing cone erosion. As a result, revolver manufacturers (with the exception of Dan Wesson) pulled their guns off the market, and the popularity of this cartridge fell off a cliff.